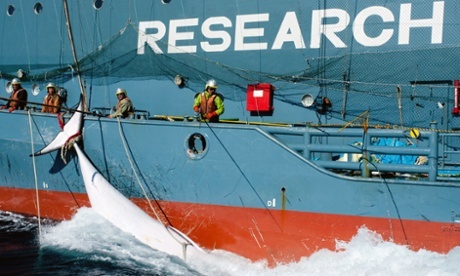 Japan expects that its whaling program in the Southern Ocean will resume next year, court documents indicate. The International Court of Justice last month ruled the program invalid, finding that it was a commercial activity disguised as scientific research. Japanese leaders have said the country plans to abide by the ruling, but the Institute of Cetacean Research has indicated that whaling could resume in a different format. In a memorandum lodged in a US lawsuit against the anti-whaling group Sea Shepherd, the institute says whaling permits would not be issued for the 2014-15 season because of the ICJ decision, but they could be issued in the following summer. "Plaintiffs expect that they will be conducting a Southern Ocean research program for subsequent seasons that would be in accord with the ICJ decision," the memorandum says. Australian Greens senator Peter Whish-Wilson said the federal government needed to take action to ensure the ICJ decision was enforced. "The prime minister needs to immediately issue a public statement that he will not accept a return to Southern Ocean whaling and will pursue all legal avenues to prevent it happening," he said on Saturday.